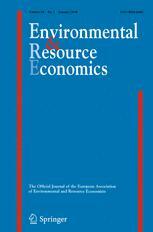 Publication de l’article « Defining the Abatement Cost in Presence of Learning-by-Doing: Application to the Fuel Cell Electric Vehicle » par Anna Creti, Alena Kotelnikova, Guy Meunier et Jean-Pierre Ponssard, dans la revue Environmental Resource Economics. We consider a partial equilibrium model to study the optimal phasing out of polluting goods by green goods. The unit production cost of the green goods involves convexity and learning-by-doing. The total cost for the social planner includes the private cost of production and the social cost of carbon, assumed to be exogenous and growing at the social discount rate. Under these assumptions the optimization problem can be decomposed in two questions: (i) when to launch a given schedule; (ii) at which rate the transition should be completed that is, the design of a transition schedule as such. The first question can be solved using a simple indicator interpreted as the MAC of the whole schedule, possibly non optimal. The case of hydrogen vehicle (Fuel Cell Electric Vehicles) offers an illustration of our results. Using data from the German market we show that the 2015–2050 trajectory foreseen by the industry would be consistent with a carbon price at 52€/t. The transition cost to achieve a 7.5 M car park in 2050 is estimated at 21.6 billion € that is, to JEl 4% discount rate, 115 € annually for each vehicle which would abate 2.18 tCO22 per year.